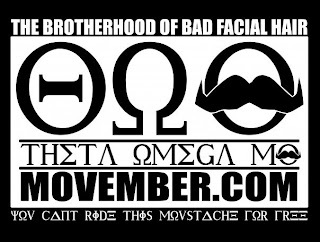 Movember is coming! Register Now! So this year, hubby and I joined Movember, an ingenious fundraising and awareness campaign for prostate cancer. The goal: men shave their facial hair off November 1st and grow 'staches over the month of November, all the while being made fun of by their better halves fundraising for Prostate Canada Canada. My involvement doesn't mean that I'll be growing a 'stache. No, ladies, you can support your man as a MoSista: campaigning, fundraising and generally raising a ruckus awareness, as well. Sign up! Join our team! Movember Ottawa is on Twitter: @MovemberOttawa - Follow it! Movember Ottawa Facebook Group - Join it! Movember Ottawa Facebook page - Like it!